... of an old package of 3.5" diskettes, I discovered my first website. 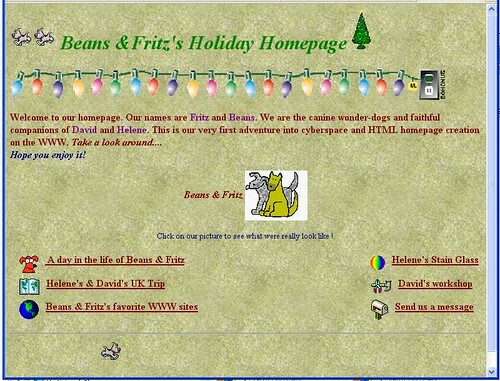 Beans and Fritz actually created a holiday homepage for 5 years - that is until my daughters entered the picture. After that they retired their web development antics for a warm sunny spot on the living floor. Anyone else still have evidence of their first website? This one was 1996. That's an ice age in web-years. :) If you're curious what the rest of it looked like, second level pages can be found here. Doing a little research for my book made me decide to crank up the way-back machine and look for my first geocities site (c. 1996) and I was horrified that it was still out there. What was I thinking!